King, Betty Nygaard. "Karen Magnussen". The Canadian Encyclopedia, 14 July 2015, Historica Canada. https://www.thecanadianencyclopedia.ca/en/article/karen-magnussen. Accessed 24 April 2019. Karen Diane Magnussen (Magnussen-Cella), OC, figure skater, skating coach (born 4 April 1952 in Vancouver, BC). She won the world championship in Bratislava, Czechoslovakia, with a brilliant performance in 1973 (courtesy Canada's Sports Hall of Fame). Karen Magnussen first donned skates at age six in 1958, at Vancouver’s Kerrisdale Skating Club. There she learned the fundamentals of skating from coach Hellmut May, who described her “strong determination.” In her first winter carnival show, she played a snowflake. In 1959 she won her club’s juvenile free skating competition, her first of many wins. Her parents (Alf and Gloria) and two younger sisters encouraged her pursuit of skating glory. In September 1960, Magnussen switched to coach Edy Rada (former Austrian and European men’s champion) at the new North Shore Winter Club in North Vancouver. A string of successes followed — first place in the 1961 BC Coast novice championships; second place in the 1962 BC Section novice championships; first place in the 1962 BC Coast junior championships; and first place in the 1963 BC Section junior championships. Magnussen first attracted national attention when she won the 1965 Canadian Junior Figure Skating Championships. By that point, she was being coached by Linda Brauckmann, who had become her coach in spring 1964 and would continue in that role for the rest of her amateur career. At age 13, Karen Magnussen competed at the 1966 Canadian senior championships. The youngest competitor in the ladies’ event, Magnussen came second in the four-minute free skating program, receiving a mark of 5.9 (out of 6.0) for artistic impression that topped world champion and eventual winner Petra Burka. Magnussen clearly excelled at free skating and was competent at compulsory figures; however, until the late 1960s, figures were worth more (60 per cent) than free skating (40 per cent). Magnussen finished fourth overall but convinced audiences that she was a future champion. The following year (1967), Magnussen placed second at the Canadian championships, earning a place on the national team. A few weeks later, at the North American Figure Skating Championships in Montréal, she placed fourth; and at her first World Championships in Vienna, where at 14 she was the youngest lady, she placed 7th in free skating and 12th overall. In January 1968, the free skating program’s value was raised to 50 per cent. That year, at the Canadian Championships in Vancouver, Magnussen became the first British Columbia skater to win the senior ladies’ crown, receiving first-place marks from every judge for free skating. The following month, she placed fourth in free skating and seventh overall at the Olympics in Grenoble, France. She also repeated her seventh-place finish at the World Championships. Despite her auspicious climb up the skating ranks, Magnussen lost to Linda Carbonetto at the 1969 Canadian championships, after falling on a Lutz jump. She fought back the following month at the North American championships to win the compulsory figures and place second to Janet Lynn of the United States in Oakland, California. Two weeks later, at the 1969 World Championships in Colorado Springs, Colorado, Magnussen was diagnosed with stress fractures in both legs and withdrew from competition the day before it began. She watched the event from a wheelchair, but was back on skates after 36 days. In 1970, the 17-year-old Magnussen won her second national title at the Canadian championships in Edmonton. At the 1970 World Championships in Ljubljana, Yugoslavia, Magnussen finished fourthoverall, ahead of Janet Lynn. She also enrolled at Simon Fraser University that year in kinesiology. The following January, at the 1971 Canadian championships in Winnipeg, Magnussen retained her Canadian title, leading after figures by an insurmountable 49 points and receiving near-perfect marks in free skating. At the February 1971 North American Championships in Peterborough, Ontario, Magnussen held a 22.1-point lead after compulsory figures over Janet Lynn. In the free-skate, six judges ranked Magnussen first, giving marks of 6.0 and four 5.9s for artistic impression and six 5.9s for technical merit, giving her the North American title. At the 1971 World Championships in Lyon, France, Magnussen was fourth after compulsory figures and rose one position after the free skate to earn bronze, her first world medal, behind Trixi Schuba (Austria) and Julie Holmes (United States) and ahead of Lynn, who (although she won the free skating) finished fourth. The results created controversy because winner Schuba, who handily won the figures, had placed 21st out of 22 skaters in the free skate and had been booed by the audience. That year Magnussen received a federal government grant of $2,000 per year for four years, the largest amount given to a Canadian athlete. Karen Magnussen’s success continued in 1972. At the 1972 Canadian championships, despite falling twice, she again won the ladies’ event. In February, Magnussen carried the Canadian flag at the opening ceremony of the 1972 Olympic Winter Games in Sapporo, Japan. At the women’s skating event, she was third after the compulsory figures, and with marks of 5.7 to 5.9 for free skating (second after Janet Lynn), she finished in second place overall behind Schuba to win silver, the only Canadian medal of those games. A few weeks later, at the 1972 World Championships in Calgary, Magnussen earned high marks for artistic impression but again placed second to Schuba overall, winning silver. To ensure that no skater could again win without mastering both figures and free skating, the International Skating Union introduced a new “technical free skate” or short program to the ladies’ and men’s events for 1973, and reduced the number of compulsory figures. The short program was worth 20 per cent, reducing the figures and free skating long program to 40 per cent each. 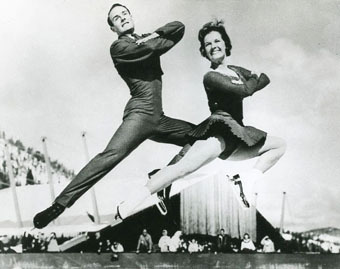 The new rules acknowledged the popularity of free skating; compulsory figures were not understood by audiences and did not translate well on television. Magnussen, a strong and inventive free-skater, derived much benefit from these changes. Under the new rules at the 1973 Canadian championships in Vancouver, Magnussen won her fifth Canadian title. During the short program, Magnussen skated her required elements (double Lutz-double toe loop combination jump, an Axel jump, flying sit spin, fast upright spin, and serpentine step sequence) flawlessly, with poise and confidence. In contrast, Lynn gave a disastrous performance, falling twice on required jumps and making an error on a spin; Magnussen again finished first. The next day, Magnussen performed the four-minute free skating program to music by Rachmaninoff. Her performance was — like the previous day’s — error-free, elegant and confident, earning marks of 5.8s and 5.9s, placing her second in the long program (behind Lynn) and enough to win overall. Magnussen was world champion, while Janet Lynn won silver and Christine Errath of East Germany bronze. After winning the world championship, Magnussen turned professional, signing an Ice Capades contract negotiated by Alan Eagleson for over $100,000 per year for three years, the highest fee paid by Ice Capades to that point. Magnussen skated for Ice Capades until 1977, then established herself as a successful skating coach. She married Tony Cella in 1978 and lived in Boston for several years before returning to Vancouver to coach figure skaters and hockey players. She was a torchbearer for the 2010 Olympic Winter Games in Vancouver. Magnussen’s coaching career ended in 2011 when she suffered a serious disabling injury after an ammonia leak at Vancouver’s North Shore Winter Club, where she worked. Long-term health problems resulted, rendering Magnussen unable to coach or, ironically, to even enter an arena. The Connaught Skating Club held a tribute for her in 2015. 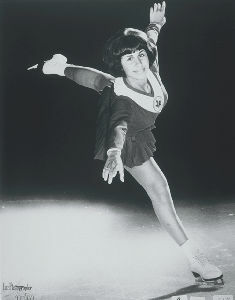 As the first figure skating champion from western Canada, Karen Magnussen opened doors for other skaters from the west. The audience and media response to her skilful free skating in 1972 and 1973 helped convince the International Skating Union to introduce the new technical short program and begin to phase out compulsory figures. 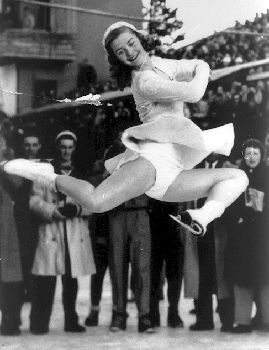 Among skaters Magnussen was known for her long spiral move, two-way split jumps, and other free skating innovations. As of 2015, no Canadian woman since Magnussen has won the ladies’ world figure skating title. Nicknamed “Canada’s Sweetheart,” Magnussen was widely popular in the 1970s. CCM produced a line of skates bearing her name, Regal Toys manufactured a “Karen” doll, and Collier-MacMillan published her autobiography in 1973. A community centre (including ice arena) in North Vancouver, British Columbia, was named for her. 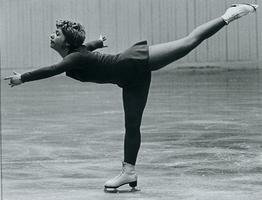 The Karen Magnussen Foundation, established in 1973, awards scholarships to young skaters. Karen Magnussen and Jeff Cross, Karen: The Karen Magnussen Story (1973). Video: Karen Magnussen Interviewed by Peter GzowskiFrom the CBC Digital Archives. Watch Karen Magnussen's 1973 World Championship long program.